Brie has waited and hoped for a remarkable twelfth birthday gift from her neighbors. What they give her isn’t even close. It’s a horrible ugly black second-hand umbrella! Now she may never go on three magical journeys and discover the secrets of Tresia. Before the beginning of Time, was the eternal Three in One. From the empty expanse of space They spoke into existence the Realms of Tresia; a home, but no family. So They created children and gave them gifts. Then Dave shows up. He’s too polite and way over-dressed. After her party, Brie’s expected to entertain “Goody-Two-Shoes” Dave all by herself. When she drops her ordinary gift down a dark shaft, her beloved Samoyed dog, Tara, leads Brie and Dave into a hidden cavern where everything changes, including her umbrella. This is her chance! They discover three powerful gems, two princesses, and a mystical swinging bridge. But Brie and her companions risk losing everything when they face the Great Dragon Rasha, evil Agent Khadol, and the dangerous Shadowshifter. 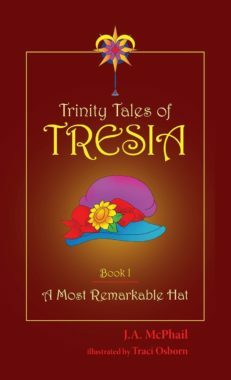 Trinity Tales of Tresia: A Most Remarkable Hat is McPhail’s third published book, an upper middle-grade inspirational fantasy and the first volume in her Trinity Tales of Tresia trilogy, released in December, 2015. The third book in the series is in the works! J. A. McPhail interviewed by Georgia Ruth Writes. Bravo, Jeannie, great job! I have thoroughly enjoyed being transported into this book, Jeannie. You did such a great job writing, describing in beautiful details so that I could put myself right there, living through your words and descriptions. And the best part is that in the midst of the fantasy world – God was lifted high and exalted. You did a clever job of pulling me into the story. I am thrilled that this prayer of Stacy’s was answered and you did it well. Blessings and much encouragement to write more. An Unexpected Adventure – Who can’t relate to Brie, the unlikely heroine of A Quite Extraordinary Umbrella? She wants her fantastical journey to the Realms of Tresia to be just like that of her role model, Winny. But nothing is turning out as it had for Winny. Brie’s twelfth birthday is a disaster. She does not get a beautiful gift, but an ugly and stupid one. She does not get a cool boy to join her on an adventure, but one in Sunday clothes who talks like an old man. Yes, she loses her temper. But who can blame her? Or blame her for forgetting to bring along a hideous old black umbrella that no young girl would want to carry? Or for sneaking off at camp with a boy who is as angry as she is? What Brie doesn’t realize, though, is that she’s about to risk everything. This quite extraordinary book will make a difference in the lives of children willing to travel to Tresia with little more than an umbrella, a thirst for adventure, and curiousity about what is really important. Hurry up book number three – This is 2nd book in this series and I can not wait for 3rd book. Reading is easy with a clear creative direction for young and older readers alike. Author uses story lines to entertain and teach of spiritual truths, same as I enjoyed while reading books by C S Lewis and Frank Peretti.-(two of my favorite authors). J A MPhail has my attention. I suggest you should each pick up a copy and give it a read. I read Book II first and liked it so well I went back to read the … – The discovery of a fantastical kingdom is a magical adventure for a twelve year old, one that Brie not only will remember but will share with others. The imagery is imaginative and the fascinating variety of characters made for a fast-paced adventure for this grandpa who usually sticks to westerns. I read Book II first and liked it so well I went back to read the first in the series, A Most Remarkable Hat. I am looking forward to Book III coming out soon, I hope. Engaging and intricate fantasy world – Book Two in J. A. McPhail’s Trinity Tales of Tresia sends 12-year-old Brie on mystical adventures with her companions to hidden caverns and the Castle of Clocks in the Land Beyond Time. There’s even a camp for kids like her, who’ve been blessed with unusual gifts and chosen to fight the evil ones of her world led by the monstrous General Rasha. My favorite part of this wonderful tale is that Brie is not all sweetness and light. She’s a kid with feelings that all kids have – disappointment and frustration with a birthday that doesn’t go just right, envy of others, and self-doubt. 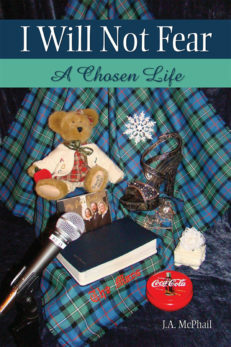 Her challenges are many and this entertaining book makes her struggles meaningful to readers. Although this tale mentions nothing specifically Biblical, it is inspired by the Christian story, as the author alludes to in her afterword. Editorial Review – J.A. McPhail’s Trinity Tales of Tresia, Book II: A Quite Extraordinary Umbrella, takes readers on a magical and spiritual adventure. No matter your age, it will leave you wondering about your own gifts and use of them. The main character shares with readers that spiritual growth happens over time. Mistakes are made, learned from, and consequences accepted. Then Brie continues her journey to become the best person she can be and to use her gifts for the good of all involved. Editorial review – A Quite Extraordinary Umbrella, is a magnificent story. I had the privilege of watching this masterpiece of work develop from its inception and when I finished reading the last chapter, I had goose bumps. Young people and adults alike will love Book II in J.A. McPhail’s Trinity Tales of Tresia series. Editorial Review – J.A. 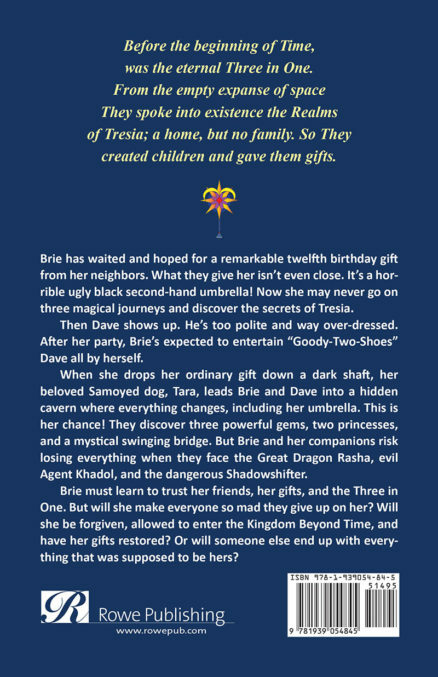 McPhail has once again fired a line drive fastball out of the park with Book II of her Trinity Tales of Tresia series. As a reader of fantasy and high fantasy for most of my life, the author has again shown her talent in weaving a fantastical story based on divine themes. Both of her works should be on the nighttime story top five list for all ages, especially for the preteen generation. Be prepared to block a weekend to read this new book as once it is started it cannot be put down until completion. I highly recommend to all ages McPhail’s latest work, A Quite Extraordinary Umbrella. Editorial Review – After reading Book II of Trinity Tales of Tresia: A Quite Extraordinary Umbrella, I am struck by the power of interweaving fantasy and real life situations in the minds of the students who read this book! J. A. McPhail inspires practical life lessons, like experiencing consequences for poor choices, and everlasting spiritual lessons, such as the benefits of having a personal Kingdom Corner to worship, study and pray. Human and animal characters represent good and evil, and the eternal impact we have on each other’s lives. I loved the character’s new names and the roles of the Messengers and Vanguards. All of these brought reflection on my own life. My favorite quote brings encouragement and challenge, “The Three in One gives gifts for a reason,” my Messenger told me. Our willingness to use them should never be a hard thing. Trust and perspective is the key to obedience. As a former elementary school teacher, and home school mom, I can imagine my students being swept away in the action and dialogue as they become part of the story, while at the same time gaining Godly insights. Happy reading! The extraordinary adventure continues as J.A. McPhail brings the world of Tresia to life once again with her vivid descriptions and flowing literary style. Young Brie and her new friend Dave take us along as they trek into a fantastic land where the ordinary becomes extraordinary and battles are fought and won by acting in faith, trust and love. Tales of magical stones, plain ol’ umbrellas, talking winged beasts, transforming scepters and powerful new friends imaginatively teach readers of all ages scriptural principles to live by. I can’t wait to find what tales await us next in the land of Tresia. Editorial Review – J. 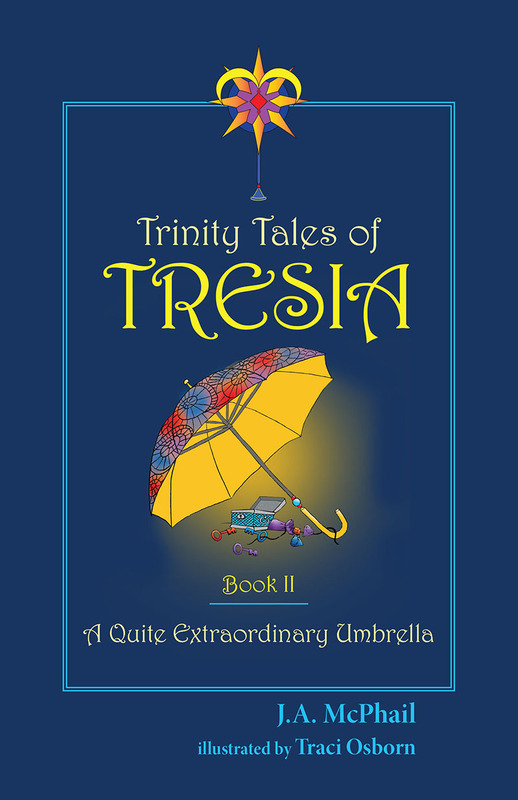 A. McPhail weaves an intricate allegorical story in her latest book, Trinity Tales of Tresia, Book II: A Quite Extraordinary Umbrella. 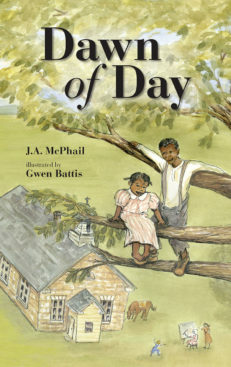 Where most authors choose to inform, McPhail entertains and educates the reader. 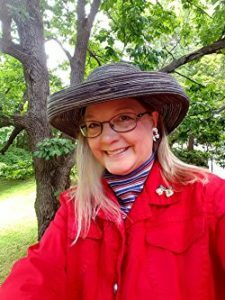 She captures the essence of excitement and intrigue and skillfully crafts a work that readers of any age would enjoy. Buckle your seat belt and enjoy the read of your life! 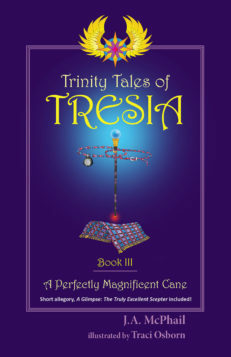 Exciting story – Trinity Tales of Tresia is the exciting story of 12-year-old Winny, who travels Beyond Time accompanied by her devoted Samoyed dog, and humor-loving best friend, Vince. The three have amazing experiences, discover incredible worlds, and meet unforgettable characters. But be warned. There’s a risk. New neighbor Rita and a determined black cat could ruin everything. Based on Christian values –  – Jeannie McPhail creates an elaborate fantasy based on Christian values for a young girl, her faithful dog, and her companions. With a comforting setting in rural mid-century America, Winny feels secure to set out for adventures in a mystical new world. From a dazzling beach to a flowing river beset with monsters, Winny courageously follows clues to fight evil and find the ultimate reward. The great strength of this tale for me are the children’s characters, Winny, Vince, and Rita. The author does not hit one wrong note with any of them. Editorial Review – The extraordinary adventure continues as J.A. McPhail brings the world of Tresia to life once again with her vivid descriptions and flowing literary style. Young Brie and her new friend Dave take us along as they trek into a fantastic land where the ordinary becomes extraordinary and battles are fought and won by acting in faith, trust and love. Tales of magical stones, plain ol’ umbrellas, talking winged beasts, transforming scepters and powerful new friends imaginatively teach readers of all ages scriptural principles to live by. I can’t wait to find what tales await us next in the land of Tresia.